Is the Earth Expanding and Even Growing? Two giants in the theory of earth expansion: Warren Cary and Klaus Vogel. Back in October of 2008, I stumbled upon a video showing an animation of the earth expanding and I was mesmerized. I couldn’t stop watching it. I had no idea of who made it or where this idea came from. All I know is that so many things fell into place, that I could not turn back. Since then, it has become one of my favorite science subjects. It explains a lot things that we don’t have answers to in science. where did the water on earth come from? why are we finding oil everywhere now? why is most all of the land mass on the earth in the northern hemisphere? what is causing this expansion? is it growing in mass, and if so, why? how can there be subduction (where plates go under other plates) with expansion? In October 2008, I spent the next nine months gathering and reading as much on the subject I could, accumulating in what is probably the largest collection of expansion tectonics material on the planet (see the Expansion Tectonics topic on this website). Along the way, I have met some of the most brilliant scientists in this area in the world. And the evidence keeps building. Funny, I first came to know expansion tectonics through Neal Adam’s incredible videos. I assumed he was a scientist. Turns out that he is a world-famous comic book artist who is also a scientist. If you are totally new to expansion tectonics, I suggest you start here. In my opintion, the indisputable evidence is demonstrated in this video: ALL the continents one earth fit together on a smaller orb with almost no modification. The chances of that being a coincidence is practically zero. But the question is how do we know how to do this? What inspired Neal Adams and others to pursue this? The answer comes from the most important map ever created of the earth: NOAA’s (National Oceanic and Atmospheric Administration). in the 1960’s NOAA surveyed the ocean floor’s age and found something shocking: the oldest seafloor bed was only 200 million years old. But more importantly, it pointed the way to expansion tectonics, not to plate tectonics. Not many people know, the the idea of expansion tectonics came before today’s plate tectonics, even though today’s plate tectonics seems as archaic as a flat earth or the idea that the earth is the center of the solar system when compared to expansion tectonics. 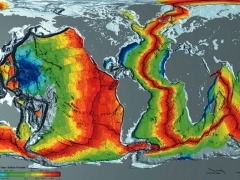 Plate tectonics became mainstream for two reasons: the idea of an expanding earth was too foreign for scientists to accept, and the fact that plate tectonics discovered subduction, the process of one plate going under another. This was important given the fact that the ocean floor is growing in area, but scientists needed some mechanism to “eat up” the excess seafloor in order for the theory of plate tectonics to remain plausible. Thus they said subduction counteracted the seafloor growth, thus keeping the earth at the same radius. There are problems with the idea that everywhere the earth expands, it is subducted. Take Antarctica for example. There is no subduction around Antarctica and yet it is expanding. It can’t get smaller. What to do? There is no answer from plate tectonics. Also, the mainstream admits they need 70% more subduction for the earth’s radius to remain constant. Truly a very big big problem. Mainstream plate tectonics also knows exactly where the south pole has been. It started in Africa, and worked its way to the bottom of Antarctica In fact, if you plot it on an expanding earth, it perfectly matches where the poles have been and gives a reason why. This fact is what changed Dr. James Maxlow from a plate tectonics person to an expansion tectonics scientist. This is another piece of evidence plate tectonic people simply don’t talk about. That seems to be a general pattern with plate tectonics: they NEVER address the principle arguments against plate tectonics. They harp on minor details, ignoring the fact for example that all continents fit together on a smaller orb without modification. Not ONE plate tectonic’s person has even tried to address that fact – the fact that for me, seals the deal and converted me in just a few minutes of watching Neal Adams video. Ignoring this is more proof that plate tectonics is as archaic as the theory of the flat earth. One complaint about earth expansion from plate tectonics is that they say you can’t have subduction with earth expansion or growth. Yes you can. And the reason is because the earth is not expanding equally all over. In fact, the it is expanding much more in the southern hemisphere than in the upper. Look at the map below. Look at the expansion below and the land mass in the lower hemisphere. There you find less land mass, and more expansion. This makes the expansion in the northern hemisphere strained. Take a look at the area in the blue oval. That is the western coastline of the United States and Canada. There, the earth is expanding, but unevenly given the expansion in the southern hemisphere is much greater. This causes some subduction by forming almost a hinge at the bottom of Alaska. There is subduction, but not in a way or in enough quantity to keep the earth at a fixed radius. The same mechanism that is causing the earth to expand and grow, is creating methane, oil, gas, and water. Oil is not from squashed dinosaurs. It is abiotic (not from fossils). Water didn’t come from comets. It is also coming from within the earth, pouring through the expanding fissures in the deep oceans. And lately, how are we be finding more and more oil and gas so far down all over the world like in the Bakken in North Dakota, the Utica in Ohio, and many other new fields. All this is being manufactured inside the earth. This is not far-fetched given mainstream science says that atoms are made in the core of the sun. The earth’s core is most likely much like the sun. There you go. Ganymede’s expansion can be seen by simple inspection. Dr. James Maxlow, a reluctant convert to expansion tectonics (he coined the term), says all this geological evidence points to not only a growing earth in size (expansion), but a growing earth in mass. Nothing cannot be created from something. So the process, although mysterious, is creating the atoms from something. Is it the “ether” modern scientists are taking about? Perhaps gravitons coming together to make atoms? Or as Neal Adams suggests “prime-matter” particles coming together in pair production (creation of elementary particles from anti-particles). Regardless, this is a big mystery and Dr. James Maxlow is turning to people in the NPA to help him solve this mystery. There are other bodies expanding in the Universe like the moon, mars, and moons of Jupiter like Ganymede (see photo to the right). Even more striking is Jupiter’s moon Europa (this links to Neal Adams videos – amazing) which NASA admits to be in the process of expanding. The plot of the largest creatures according to mainstream science. With the mass growing, it now explains why dinasaurs were so big. Numerous engineers have pointed out that these gigantic creatures could not have survived in today’s gravity making it impossible to pump blood, walk, or survive today. Here is a plot of the biggest creatures during life on earth and it points to a growing mass. As my friend Neal Adams says: the fact that the earth is growing changes everything. He is right. Just because we don’t yet have an agreed upon mechanism for the growing / expanding earth, doesn’t mean it isn’t growing or expanding. We have no idea how laser light works or what light is for that matter, yet the laser is probably the most important technology we have today. It doesn’t exist because we don’t know how it works? That is just plain stupid. The 64 thousand dollar question is what is making the earth expanding and grow? Are they the same mechanism? When I stand on the beach in my city of Long Beach California, I now see the Pacific Ocean in a very different way. It no longer is simply a body of water, but a growing body of water which 200 million years earlier, did not exist. I see an incredible future for science now that we know the earth is growing. Science has some BIG questions to answer and big changes. And this means big fun for those of us who love science and anyone who has ever thought about our universe and how it works.